L.A. coffee chain Alfred Coffee teams up with the Power Rangers for a limited-edition collaboration that includes five limited-time drinks (one for each of the original Power Rangers). - Black Ranger (Melrose Place) - Charcoal, espresso, dark chocolate, and milk. - Blue Ranger (Silverlake) - Thai butterfly pea flower, star anise, coriander, cane sugar, and milk. - Yellow Ranger (Studio City) - Turmeric, ginger, lemongrass, cane sugar, and milk. - Red Ranger (In The Alley - West Hollywood) - Maqui berry, blueberry, raspberry, wild guava, honey, and coconut milk. - Pink Ranger (Brentwood & Tea Room - Los Angeles) - Beetroot, vanilla, cinnamon, and coconut milk. 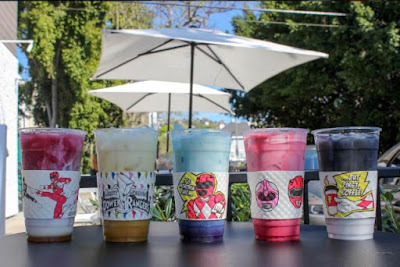 In addition to the matching color scheme, the partnership features exclusive Power Rangers drink sleeve designs for the drinks. Both the drinks and the sleeves are available through May 7, 2017.